Ask fellow campers about "Twilight on the Erie RV park" and nearby attractions. Park is 3 years old and still needs a lot of work. Nice landscaping at camp office/store but not much done in rest of campground. Good location on Erie Canal but no access from campground and brush has grown up blocking the view. Pull thru sites are in a field with saplings that will eventually provide shade. Sites are FHU, sloping gravel amidst mowed weeds. May become a "resort" in future but is currently overpriced. We camped at Twilight on the Erie RV park in a Motorhome. Close to Rochester and it's eastern suburbs with lots of nearby shopping centers. 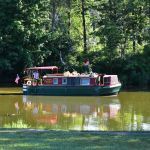 Large open field just outside campground with access to Erie Canal for kayaking and fishing. Still in their infancy as a park they are building on a foundation. Park is on a hill and most sites are not level. We had about a 4" drop front to rear on site 80. They had a bluegrass festival Saturday afternoon/eve but we were there visiting family and weren't around for it. Check in was friendly and owner allowed us to take an open pull thru instead of the back in we'd reserved at no extra charge. They were very friendly and accommodating. Some turns were a little tight in a 41' DP. We camped at Twilight on the Erie RV park in a Motorhome. 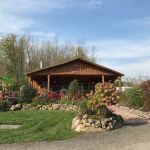 Close to Rochester, about anything you could want within a short drive. walking/riding trails along the Erie canal. Great family oriented campground. The swimming pool. unheated, is very clean and designed for children as the maximum depth is 4'11". 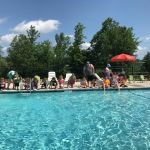 An extensive play ground is adjacent to the pool as well as a game room. We camped at Twilight on the Erie RV park in a Travel Trailer. Water sports such as canoeing and kayaking are available on the Erie canal. Just north of the canal is the bike path on the old towpath that goes for miles in either direction. Located almost equal distance from NYS Truway exits 44 and 45 the 6 mile trip is well worth it. Food- Macedon Hills Family Restaurant, Flaherty's and The Empire Grill nearby. We stayed for a month in a 36ft coach. It's a new park and they are still working on landscaping and some sites. The roads and sites are gravel and very large. It's generally quiet, but the train comes by till 10pm. This is our second year here, we find the staff very helpful and friendly. We camped at Twilight on the Erie RV park in a Motorhome. Close to Rochester and lots to see in Palmyra. The other reviews are correct about how new and nice this place will be "someday" but in my opinion not now. We stayed here for an overnight and the park was nearly empty. The reason became clear fairly soon: trains. Lots of them and they are close by with horns blasting at least one an hour sometimes more ALL NIGHT! It gets better! Early morning an hour before sunrise the gunfire starts. Lots of it - automatic weapons, rifle shots, shotguns and it is close. Real close. We cleaned up and left before some nut put a dozen holes in us and our rig. We camped at Twilight on the Erie RV park in a Motorhome. I was really looking forward to staying in this new park because of the great location and good reviews. There are some very nice things about it, but it didn't live up to all my expectations as a traveler. This could be a better place for seasonals than those traveling through. The good: Beautiful land on a ridge above the Erie Canal. Most spaces are open, but there are two shaded roads. One road overlooks the canal. We were fortunate to get a shaded site even though we stayed just four days. Most of the sites with big trees are for seasonals. The staff is very friendly, but a little hard to find. Follow the directions on the office doors if no one's there. We did not use the bathrooms, but we did use the laundry which was quite nice. I got some help from a busy worker in the laundry. She took the time to drive me to the office to get change for the machines. The bad: I think the owners took on a little too much with this project. They cleared and graded many acres of land, but have not been able to finish it all. Some roads were unfinished and piles of building materials were lying around. Not too safe for kids. The campsites were not well tended. Our grass was very long and the campfire had bottles and trash in it. In our four days of hot weather, the grass was not mowed in our campsite. People were working hard at getting the pool house painted, but nobody seemed willing to do a little housecleaning on our street or cleaning out the campsites after renters leave. Placed here and there around the welcome area were lots of oddball salvaged items in various states of disrepair. Some things from the pool were just piled up and stored on the office porch. The owner must like salvage, but to others it's junk. The trains didn't bother us, but they were loud. I will stay at Twilight again because it's beautiful, close to our family, and the people are friendly. I just hope they can clean it up a little. 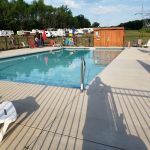 We camped at Twilight on the Erie RV park in a Travel Trailer. Close to the eastern suburbs of Rochester. Good shopping. Lovely towns. As previously stated, 2015 was the opening year for this park. There are still some finishing touches to be done, i.e. the pool is not finished, and the sites' gravel pads are to be widened and re-leveled in the fall. The owners aim to please and are very enthusiastic about their park. Many of the sites are taken by seasonal people, with weekends being the busiest. The setting is very rural, but retail stores for just about anything are within 10-15 minutes away. It is very quiet there. The utilities work well, including the wi-fi. The sites are nice and wide, too, so you don't feel as if you are on top of your neighbor. We will definitely return next year as we have family in the area and this park is the best one for more than a weekend stay. We camped at Twilight on the Erie RV park in a Motorhome. This is a brand new park that still has work to be done but when complete will be lovely. Pool,arcade,playground and level sites are in. Some permanents but lots of weekend sites. Close to shopping and local restaurants. Small store on site. Owners are accommodating and on site. Will be a treasure for the Rochester area, 20 minutes away. 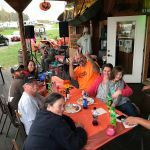 We camped at Twilight on the Erie RV park in a Fifth Wheel. Water sports such as canoeing and kayaking are available on the Erie canal. Just north of the canal is the bike path on the old towpath that goes for miles in either direction. Located almost equal distance from NYS Truway exits 44 and 45 the 6 mile trip is well worth it. Food- Macedon Hills Family Restaurant, Flaherty's and The Empire Grill nearby. Walmart - 2 miles Lowe's - 3 miles. 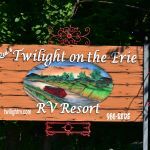 Are you affiliated with Twilight on the Erie RV park ?